Sorry about the title, I thought it was a good line, until I realized well, it's not. Oh well, let's see you come up with something better. This is old news now, but Tyree Glover was arrested on Tuesday in Durham and charged with trafficking cocaine. After a search of his dorm room, he was also found to be in possession of marijuana and was held in jail in lieu of $750,000 bond. Legal experts would know better, but I believe the trafficking charge for the amount of cocaine he possessed is a class G felony, which carries a maximum sentence of 42 months in prison and $50,000 fine. As would be expected, Coach Cutcliffe acted swiftly in dismissing Tyree from the program for “conduct unbecoming of a member of the program.” As a sophomore, Glover played in 11 games for Duke and started the September game at Wake Forest. It’s an unfortunate development for the program, both as a knock on Duke’s reputation and a loss of depth at linebacker. While I hate to try and find a bright side in situations like this, Glover’s dismissal will open up another scholarship this fall, which could certainly help with only 12 players in their final year of eligibility. Though his serious lack of judgment is indefensible, we all certainly hope that Tyree is able to turn things around for himself. The Blue Devils sent four players to the NFL in 2010, though none were taken in the NFL Draft. Duke has several NFL hopefuls again this year, and the Blue Devil Nation will be pulling to hear their names called on Thursday. At Duke’s annual Pro Day, DE Patrick Egboh, OG Brandon Harper, TE Brett Huffman, WR Austin Kelly, TE Brandon King, LB Abraham Kromah, CB Chris Rwabukamba, and LB Damian Thornton worked out for NFL scouts, and a few have had additional workout invites in recent weeks. In all likelihood, the Duke seniors may have to work their way into the league again this year via the free agent and training camp invite routes. Next to winning games, establishing players in the NFL is essential to help the Blue Devils recruit elite athletes. The last of ACC spring practices will wrap up this weekend, and the ACC coaches held their spring conference call earlier this week. Since we toured around the ACC in last week’s Football Friday, we won’t do it again. Much of what we discussed last week still holds true: QB battle will head into August in Miami, Virginia Tech expects David Wilson to be very good, etc. Boston College expects to have Montel Harris back for the fall, but he was held out of their spring game for precautionary reasons, so we’ll keep an eye on his health as we head towards September. As for Duke, Coach Cutcliffe didn’t have much to add, given that Duke wrapped up spring practice nearly a month ago. He reiterated the team’s youth, especially along the defensive front, where 10 of 15 players are underclassmen. He’s excited about the speed on defense and thinks that Coach Knowles did a good job with personnel assignments this spring, which we can only hope will continue into the fall. We’re all excited to see this Duke offense, as it has the potential to be great with an improved and consistent running game, along with three competent quarterback options. But back to the defensive front, as that’s what makes me lose sleep at night. Coach Cutcliffe reiterated that he hopes to play up to 9 guys along the defensive front, which is an interesting concept. When was the last time Duke had that many ACC caliber defensive linemen? Are there teams that routinely use that many players along the defensive front? Of course, any team with decent depth rotates guys in and out, but I get the impression that Cutcliffe hopes to have 8 or 9 guys who play significant snaps each game. It’s really an intriguing strategy, given the group of players Duke currently has. With so many young first or second-year players up front, and with no clear-cut All-ACC caliber player(s), why not try to get 20-30 good snaps out of each guy? The most obvious benefit is that it will hopefully keep the unit fresh for late in games, but it also reduces the amount of pressure on each individual player. I’m sure there’s both advantages and disadvantages to this potential rotation, but I’m interested to hear your thoughts (message board, anyone?). As you might imagine, we haven’t heard much from the Duke staff this week, as the assistants have been on the recruiting trail. With the opening of the spring evaluation period last Friday, Coach Cutcliffe and the staff made calls to many of the high priority recruits to re-affirm Duke’s interest. It never hurts to be the first coach in a prospect’s ear, and Duke hopes it will pay dividends with some spring and summer commitments. Speaking of commitments, Coach Cutcliffe has mentioned his desire to have the class of 2012 essentially set by the start of the season, which some fans may have concerns about (the author included). We all know that many elite prospects, whether in basketball or football, tend to drag their recruitment out until the last possible minute. If Duke fills up its scholarships in August, it doesn’t leave much room for the January or February commitments. With a small class this fall, Duke doesn’t have a lot of margin for error, so it does make sense for the Blue Devils to try to secure the majority of their class by the fall. I don’t think Duke will be done with recruiting before the season, but it would be nice if they can get their commitment list into the double digits, hopefully leaving the remaining scholarships for some late-deciding elite talent. As we say on the message boards, just my .02. 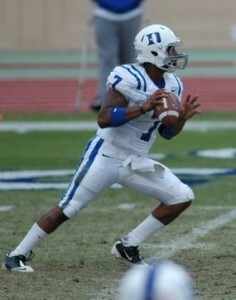 With Anthony Boone's play this spring, it may not be essential to take a QB in 2012. QB: With only one offer extended so far, Duke seems to think they have a good chance with Bilal Marshall, and that seems like a reasonable assumption as this point. When we last heard from him, he was favoring Wake Forest, mostly because they were the first to offer and the only school he had really visited to date. That remains the case, though he is mostly wide open. The hope is that Duke can get Marshall on campus this summer, perhaps for Coach Cutcliffe’s QB College, and then go from there. This is a situation not unlike basketball, where if Duke loses out on Marshall, they could have a lot of ground to make up with some of the other QB prospects. That being said, the chance to play for the mentor of Peyton and Eli Manning is still pretty attractive. With the play of Connette and Boone this spring, it’s also not a requirement that Duke takes a QB in this class. RB: If I said it’s not a requirement that Duke takes a QB in this class, then I have to say that it is a requirement to take at least one RB in this class. So I think we’ve established that Keith Marshall is a long shot, and I would add that Dami Ayoola and Nick Tompkins might be as well, since both already have double digit offers. We heard from Dontonio Jordan and Todd Gurley this week that Duke remains in the mix for them, and there’s still a long way to go in both of their recruitments. As for the South Carolina prospects, Duke is Dondre Brown’s only offer to date, while Jay Jay McCullough has an offer from in-state Clemson, which might be tough for any school to overcome, but we'll hear from him tomorrow. WR: This is a tough group to really evaluate, as several have yet to visit Duke’s campus, which is never a good omen, though a few are from the West Coast, which makes it more understandable. We’ll hear from Justin Johnson over the weekend, and Duke is very much in the mix for his services. Of those on the East Coast, we’ll also hear from Jared Crump this weekend, and P.J. Harris and Desmond Frye are recent Duke offers. TE: Duke remains in the mix for Dan Beilinson and already has a commitment from Erich Schneider. OL: Duke has made a good impression on Andrew Jelks, Eric Olson, and Max Tuerk. 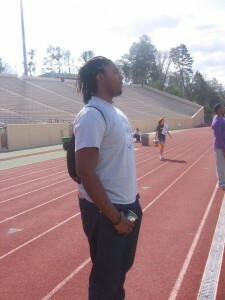 In fact, I just heard from Eric that he will be on campus this weekend in Durham. Don't get excited about D.J. Humphries. I'm working on hearing from some of the new OL names. DL: D.J. Reader and Carlos Wray have made multiple visits to Durham, and Duke has impressed Korren Kirven and Matt Godin, though Godin is a lifelong Michigan fan with a Wolverines offer. We’ll hear from Sheldon Rankins and Nigel Williams this weekend, two other good looking prospects with Duke offers, who appear to have some interest in the Blue Devils. LB: Deion Williams and Keilin Rayner are at the top of the list and both have Duke near the top of theirs at this point in the process. Would be nice to get one of these guys on board soon. DB: Dwayne Norman will be making a decision this spring and it looks like it is down to Duke and South Carolina. Derek Jones has a good relationship with Miami’s Larry Hope. 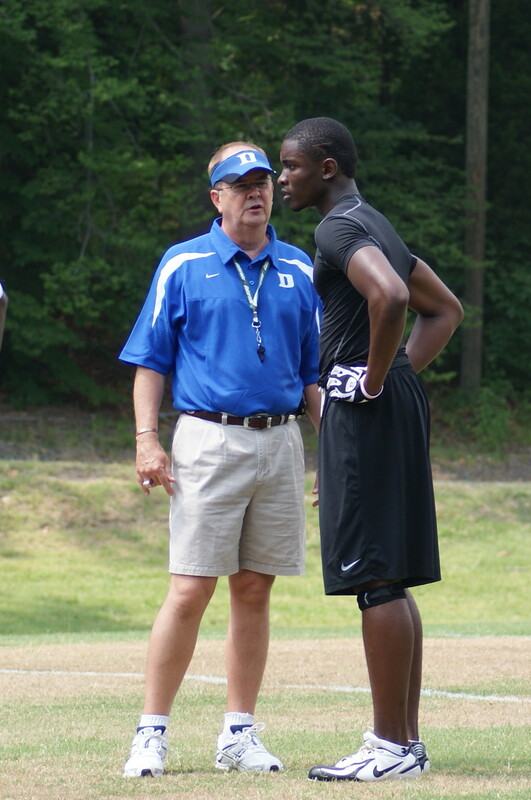 Duke was among the first to offer MarQuise Jones, Albert Reid, and Jonavaughn Williams. Would also be nice to get a DB on board soon. Kicker: I didn’t mention this last week, but I see that it’s up on another site, so I’ll address it. 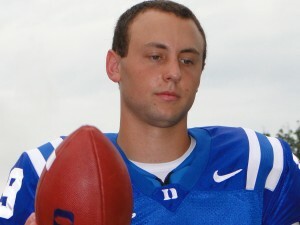 Duke will, in all likelihood, need to take a placekicker in the class of 2012. Two in-state players, Paul Griggs and Brad Pinion, have both visited Duke and like the Blue Devils. With few scholarships available, it would be nice to be able to find a walk-on kicker, but it may be necessary to offer a scholarship in order to get an elite one. We’ll also have to see exactly where Will Monday is with his placekicking when he gets on campus this fall. Monday is expected to challenge Alex King for the starting punter job. As you can see, the potential is there for Duke to put together a really good class in 2012, with almost all of the prospects mentioned likely to be rated as three starts or higher. The next few months are the critical period, as Duke will look to close out the recruitment with some of these players and receive commitments before the start of their senior year. We’ll do our best to stay on top of football recruiting and bring you the best, most efficient coverage around. Feel free to jump in with your thoughts, questions, etc. on the message board. Until next week, WE ARE DUKE. DURHAM, N.C. - Anthony Boone's 32-yard touchdown pass to Tyree Watkins with 11:15 remaining in the fourth period lifted the White squad to a come-from-behind victory over the Blue unit in Duke's annual Spring Game on Saturday afternoon at Wallace Wade Stadium. Saturday's event brought spring practice to a close for the Blue Devils. The Blue team opened the scoring with a 14-yard touchdown run by Patrick Kurunwune at the 8:51 mark of the first period. Just over four minutes later, Brandon Connette found the end zone from 14 yards out on the ground to push the lead to 14-0. The White team managed to pull within seven prior to halftime when Sean Renfree hooked up with Conner Vernon on a six-yard touchdown pass. Midway through the third quarter, Desmond Scott brought the White unit even on the scoreboard with a 16-yard touchdown run. On the day, Renfree connected on eight-of-14 passes for 105 yards and one touchdowns while Boone was seven-of-15 through the air for 94 yards with one touchdown and one interception. Scott paced the White team with 56 rushing yards on 13 carries while Juwan Thompson gained 35 yards on nine rushes. For the Blue unit, Connette completed 10-of-16 throws for 102 yards while rushing for 34 yards on eight attempts whileJosh Snead picked up 54 yards on six carries. Watkins finished with six receptions for 67 yards while Brandon Braxton (21 yards), Cooper Helfet (64 yards) and Vernon (19 yards) had three catches apiece. Defensively, Jamal Wallace carded a game-high seven tackles while Austin Gamble had six total stops. Issac Blakeney, Walt Canty, Matt Daniels, C.J. France, Tyree Glover and Jonathan Woodruff logged five tackles each, with Blakeney also contributing two tackles for loss, one quarterback sack, one caused fumble, one quarterback pressure and one pass breakup. Charlie Hatcher, Jordan DeWalt-Ondijo and Tony Foster each recorded one quarterback sack while Garrett Rider's interception in the fourth quarter was the game's lone turnover. Cutcliffe also announced the program's award winners for spring practice award winners with Thompson (Most Improved Offensive Player), Ross Cockrell (Most Improved Defensive Player) and Preston Scott (Blue Devil Heart Award) claiming honors. 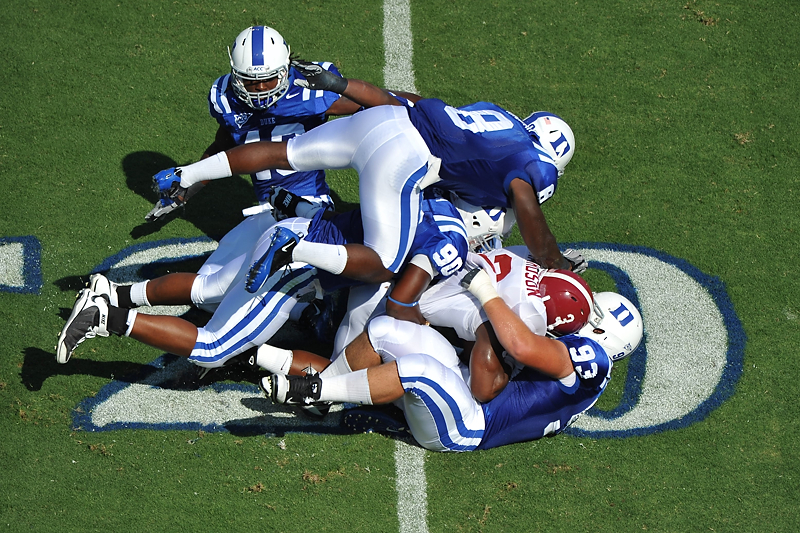 Duke opens the 2011 season at home on September 3 against Richmond. Season tickets are available online at GoDuke.com or by calling the Duke Athletic Ticket Office at 1-877-631-3853.